When choosing a home warranty plan, it is important to know that the plans can be customized so you’re only paying for the coverage that will be most valuable to you and your home. Regardless of the home warranty you choose, only pre-screened service providers will be dispatched for any repair or replacement to ensure your home systems and appliances are always in good hands when you request service. 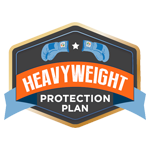 Optional coverage is available so you can protect both your covered item and your budget. See the chart below to understand the different home warranty plans and optional coverage available.